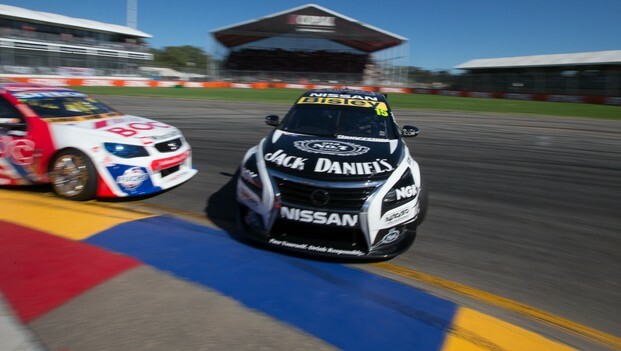 The slowest corner in the V8 Supercars Championship is set to literally delay the progress of Nissan’s four factory Altimas after their top 10 triumphs at Albert Park. The banked turned four hairpin at Symmons Plains in northern Tasmania – the venue for round two of the championship on April 5-7 – dumps out onto the circuit’s longest straight. And that is just what the under-powered Nissans don’t like – full throttle acceleration from a virtual standstill. “You really have to stop it and turn it and then you ask for full throttle really early on. That will really knock us around. Kelly suggested that even the perfect lap in qualifying would struggle to net a top 10 time for the new Altimas because the Nissan VK56DE V8 engine is lacking the meaty torque curve of its Ford and Chev push-rod rivals. Cynics might suggest Kelly was sounding similarly gloomy before the non-championship Grand Prix meeting, but the flowing nature of the Albert Park circuit and the handling balance of the Altima chassis meant both the Jack Daniel’s and Norton 360-backed entries consistently challenged for the top 10. James Moffat emerged the best of the quartet with a fifth place in race two and seventh overall, while Todd and Rick Kelly and Michael Caruso all made their presence felt as well. “That was a surprise to me as much as anybody,” admitted Todd. “Luckily the cars are just fantastic at the moment, a lot better than I could have hoped for. Kelly said a visit to the team during the GP meeting by two Nismo engineers wouldn’t yield any short term engine benefits. “They have a lot of good ideas and they have sent a few bits over to test on our dyno that we can just bolt on to our engine, but unfortunately nothing stood out as a quick fix for us to get anything in the short term. “So if anything they are sending over works then we will have to try and adapt it to our engine and see whether we can fit it in the car and go from there. All four Altimas will run a slightly different camshaft spec that Rick Kelly only had access to previously. A suspension update is also scheduled for Tasmania. Kelly said that constant and small developments rather than huge breakthroughs would be the plan going forward.